I often make Kheema stuffed capsicums but this time I wanted to cook for someone who does not eat mutton, so I was searching for capsicum recipes when I found an old book by Chef Sanjeev Kapoor that had this amazing stuffed capsicum recipe of tandoori paneer stuffed capsicum. 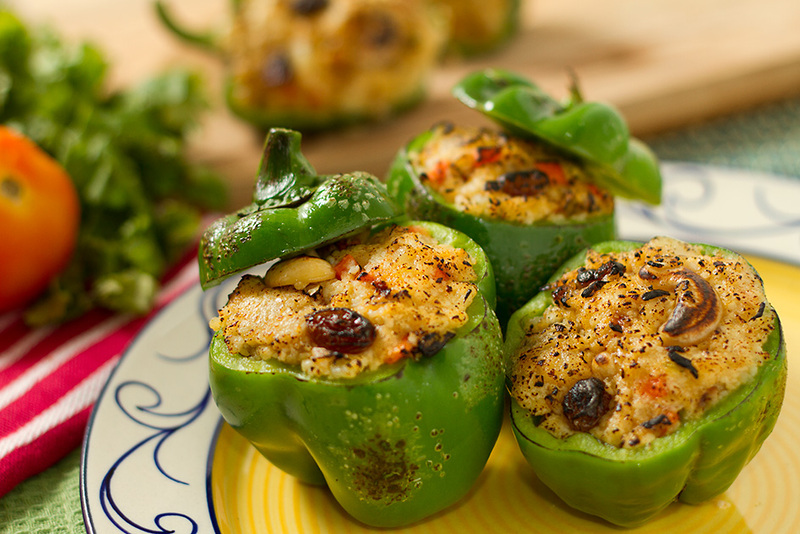 Though instead of using a Tandoor or barbecue, I grilled the stuffed peppers in my oven. The recipe uses paneer or cottage cheese along with boiled and mashed potatoes so grilling makes the exposed filling nicely crisp while it’s soft and juicy inside. If you do not have an oven, use a pan sprayed with oil and cook on low heat to get the desired results. You can also use a butane torch for browning tops of the filling. I have used green capsicums, but feel free to use red, yellow or orange capsicums. Capsicum (also known as peppers) is a genus of flowering plants in the nightshade family Solanaceae. Its species are native to the Americas, where they have been cultivated for thousands of years. In modern times, it is cultivated worldwide, and has become a key element in many regional cuisines. In addition to use as spices and food vegetables, Capsicum species have also found use in medicines. The fruit of Capsicum plants have a variety of names depending on place and type. The piquant (spicy) varieties are commonly called chili peppers, or simply “chillies”. The large, mild form is called red pepper, green pepper, or bell pepper in North America and typically just “capsicum” in New Zealand,Australia, Singapore and India. The fruit is called paprika in some other countries (although paprika can also refer to the powdered spice made from various capsicum fruit). Halve the capsicums vertically or remove the top to make a hollow. Remove the seeds, Rub some oil and salt inside and outside the capsicum halves and set aside for ten minutes. In a wide pan, heat oil, add ginger, garlic, green chilies and onions. Saute till onions become translucent. Add Chilli powder, cashew-nuts, raisins and fry for a few more minutes. Add mashed potatoes and cottage cheese and mix well. Fry for about 5 minutes in medium heat, remove and keep aside. Stuff the capsicums with the prepared cottage cheese and potatoes mix. Preheat the oven at 180°C, grease the baking tray and roast the capsicum till the capsicums soften slightly and the stuffing is brown. Serve hot with Indian or a fusion meal. 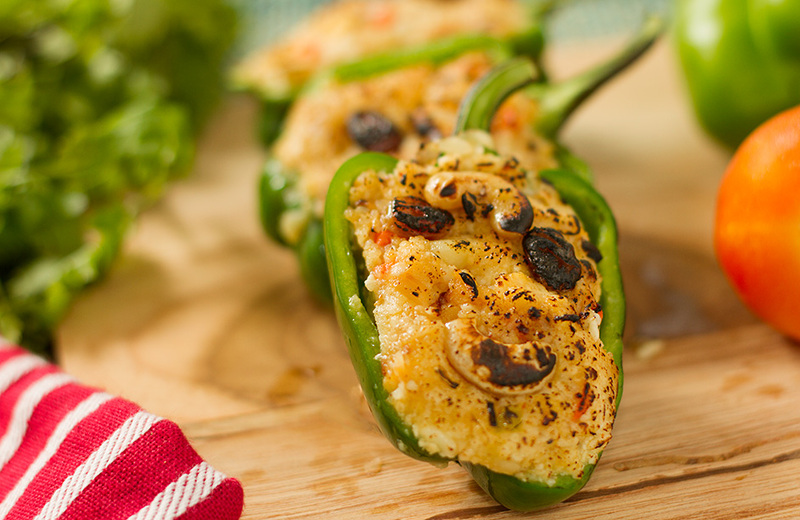 Paneer Stuffed Capsicum is a very versatile dish. You forgot the step of putting the stuffing inside the capsicums. Thanks for bringing it to my notice. Added. This looks very beautiful and delicious. Thank you for a nice recipe !